One of the speakers who presented at Friday’s news:rewired – noise to signal event has created a fantastic Storify of the event. Mark Jones, who is global communities editor for Reuters News, has created this summary of tweets, photos, articles and personal comments brought together with an easy-to-follow narrative. It does not include all sessions but gives an overview of journalist, writer and freedom-of-information campaigner Heather Brooke’s keynote speech, a session on sorting the social media chaos, another on social media strategy and a round-up what went on at a session on liveblogging. This entry was posted in Editors' pick, Events and tagged #newsrw, Mark Jones, news:rewired, storify on May 31, 2011 by Sarah Marshall. The main difficulty for data journalist in the UK is gaining access to meaningful data, Heather Brooke said in her keynote speech at news:rewired – noise to signal. Brooke, a journalist, author and freedom-of-information campaigner, who is best known for her role in bringing the MPs expenses to light and who went on to work with the Guardian on the WikiLeaks cables, compared the difficulty in accessing data in the UK compared with the US, where she trained and worked as a political journalist and a crime reporter. When working in the US, Brook explained how she was “heavily reliant on public records” and said the “underpinning of my journalism was state records”. As a crime reporter she used a police scanner, likening it to those familiar with US series ‘The Wire’. “As a journalist I would decide what the story was,” she said, based on the data from public records. She was able to note patterns in the incident reports and able to notice a spate in domestic violence, for example. Brooke told of how many UK police forces limit the release of their data to media messages left on a voice bank. Public bodies in the UK “control the data, they control the public perception of the story,” she said. “How do any journalists in the UK do their job?” she asked. And it was that problematic question that led her to becoming an FOI campaigner. When she asked for receipts for US politicians’ expense claims in the States, she had them within a couple of days. It was a different story in the UK. It took her five years and several court cases, including taking the case to the High Court which led to the release of second home allowance for 10 MPs. The House of Commons “sticking their feet on the ground” refused to release further data, which had been scanned in by the fees office. A CD of the data which was touted round Fleet Street and sold for £110,000. The Telegraph, rather than Brooke, then had the data and had to verify and cross check it. What is purpose as journalists in the digital age? Brooke’s answer to that question is that “we need to change an unhelpful attitude” of public records being withheld. “The information exists as if they own it”, she said. “They don’t want negative information to come out” and they want to try and manage their reputation, she said in what she described as “the take over of public relations”. “We need to be campaigning for these sets of data” and gave the examples of courts and the release of files. She said data journalism is “not just about learning how to use Excel spreadsheets but you have to have something to put in those spreadsheets”. Brooke made a “rallying cry” as to why professional journalists, particularly those who practice investigative journalism, are vital. The “one unique selling point, why people would come to a professional news organisation” is the training and experience journalists have in “sifting through for what is important and what is true”. Brooke said as people have more and more information, a journalist’s role is distilling and signposting the information. The second key point she made is journalists must establish “what is true”. When a politician claims that crime has gone down, a journalist must be able to verify it and “test the truthfulness” of it, she said. She explained that journalists need to know how that data was collected and, ideally, have access the data itself. Brooke told how she tried to pitch stories on MPs expenses on an almost daily basis before they came to light. She said editors thought it was a non-story and “almost took the word of parliament” and had the perception that the public was not interested. But they were. This article is a cross post. It was originally published on news:rewired. This entry was posted in Data, Events, Investigative journalism, Press freedom and ethics and tagged heather brooke, MPs expenses, news:rewired on May 27, 2011 by Sarah Marshall. 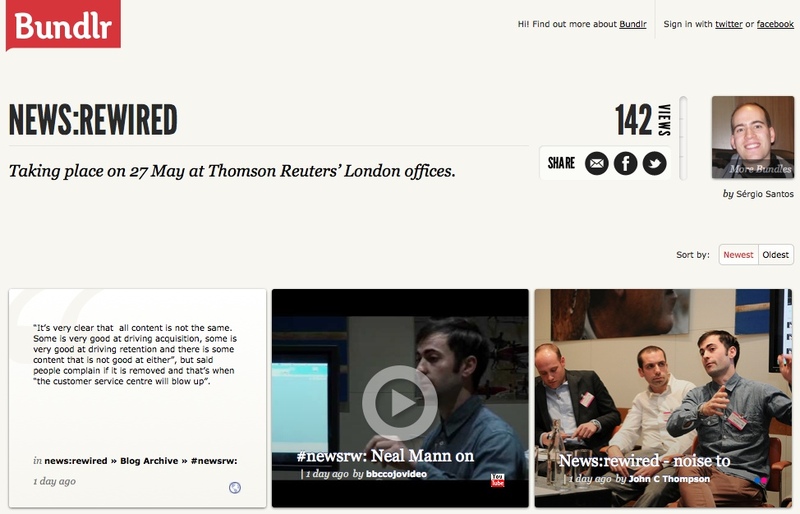 Journalism.co.uk’s news:rewired – noise to signal event is taking place today at Thomson Reuters, Canary Wharf, London. The one-day conference is focusing on data journalism and how to filter the noise of large datasets, social networks, and audience metrics into a clear signal. The key-note speaker is journalist, author and freedon-of-information campaigner Heather Brooke, who is best known for her role in bringing MPs expenses to light. Other speakers include key players from the BBC, the Guardian, Reuters News, the Telegraph, News International, the Economist and Channel 4 News, the Independent, the Financial Times, the Press Association and Sky News, plus lots of smaller organisations specialising in data, social media and journalism. To keep up-to-date with what is happening today, follow the #newsrw hashtag, @newsrewired on Twitter, posts and a liveblog on newsrewired.com and stories here on Journalism.co.uk. You can also search stories, photos, videos and audio across the web by using the #newsrw hashtag. This entry was posted in About us, Data, Events, Journalism and tagged #newsrw, news:rewired on May 27, 2011 by Sarah Marshall. Every journalist needs to know about data. It is not just the preserve of the investigative journalist but can – and should – be used by reporters writing for local papers, magazines, the consumer and trade press and for online publications. Think about crime statistics, government spending, bin collections, hospital infections and missing kittens and tell me data journalism is not relevant to your title. If you think you need to be a hacker as well as a hack then you are wrong. Although data journalism combines journalism, research, statistics and programming, you may dabble but you do not need to know much maths or code to get started. It can be as simple as copying and pasting data from an Excel spreadsheet. You can find out more about getting started and trying your hand at complex data journalism at news:rewired – noise to signal, on 27 May. More details about the event are here and you can order tickets, which cost £156 including VAT, by clicking here. Here are 10 reasons to give data a go. 1. Everybody loves a list. Did you click on this post as you wanted an easy-to-read list rather than an involved article? 2. Everybody loves a map. Try Quantum GIS (QGIS), a free, open source tool, or OpenHeatMap, a fantastic, east-to-use tool as long as your data is categorised by country, local authority, constituency, region or county. 3. Tools bring data to life. Applications such as ManyEyes and Yahoo Pipes mash data and turn complex numbers and datasets into easy to read visualisations that work well both online and in print. Try this how to guide to Yahoo Pipes to get you started. 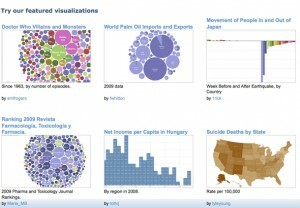 Here are 22 data visualisation tools from Computer World. 4. Data may need cleaning up. Try using clean up tools like Scraperwiki, which helps non-technical journalists copy a few lines of code to turn a document such as pdf into a number-friendly file like a csv, and Google Refine, which Paul Bradshaw has written some useful posts on over on the Online Journalism Blog. 5. Data of all sorts is increasingly available. The open data movement across the UK is resulting in an increase in the release of data. The possibilities are huge, says Paul Bradshaw on the Guardian’s Datablog. January 2010, saw the launch of data.gov.uk, a fantastic resource for searching for datasets. 6. Data journalism can answer questions. A good place to start in data journalism is to ask a question and answer it by gathering data. Numbers work well. One option is to submit a Freedom of Information request to ask for the numbers. It helps if you ask for a csv file. 7. You can use the crowd. Crowdsourcing by asking a question on Twitter or using a site like Help Me Investigate, an open source tool for people can use to collaborate to investigate questions in the public interest. 8. Data can be personal to every reader. DocumentCloud can highlight and annotate documents to help readers see what is important and learn a document’s back story. 9. “Data journalism is not always presenting the data as journalism. It’s also finding the journalism within the data,” Jay Rosen said in relation to this article on Poynter on how two journalists from the Las Vegas Sun spent two years looking at 2.9 million documents to find out what “what’s right, and wrong, about our local health care delivery system”. The result was that the journalists exposed thousands of preventable medical mistakes in Las Vegas hospitals. The Nevada legislature responded with six pieces of legislation. 10. “Data ethics is just as important as ethics in journalism, in fact they are one in the same,” according to this post on Open Data Wire. Consider the BBC’s FoI request which showed a 43 per cent rise in GPs signing prescriptions for antidepressants and the ethics of unquestioningly relating this to the recession. Ben Goldacre has highlighted the problems with seeing patterns in data. This is a cross post originally published on the news:rewired website. You can get your tickets here. A full agenda for news:rewired – noise to signal, is here. A list of more than 20 speakers is here. This entry was posted in Data, Editors' pick, Handy tools and technology, Journalism, Multimedia, Online Journalism and tagged computer world, Data journalism, Many Eyes, news:rewired, OpenHeatMap, QGIS, yahoo pipes on May 3, 2011 by Sarah Marshall. This was Citizenside editor-in-chief Philip Trippenbach speaking in an #ijf11 session earlier today called Beyond the Article. Trippenbach has been trumpeting the benefits of gaming for journalism for some time now. He made a convincing case for gaming at a recent Journalism.co.uk news:rewired event called, coincidentally enough, Beyond the Story. Trippenbach has worked on interactive projects for the BBC and a host of other outlets. But clearly the “G word” is still a long way from taking root with most journalists. He made a convincing case again today. This time – having joined citizen press agency Citizenside in January – for the power of gaming for citizen journalism initiatives. The most powerful interactive form is gaming, in terms of interactive journalism, that is where the win is. When you talk about gaming baked right into the heart of a package, that is very profound. With the addition of Trippenbach to its staff, Citizenside is certainly baking gaming right into the heart of its operation, and he outlined how it is using the form for two key purposes. Citizenside users are encouraged to progress from level to level by accomplishing certain tasks, or “missions”, just like you did when you played computer games as a kid (or maybe as an adult too – according to Trippenbach more people in Western Europe and North America play computer games than don’t, although I forgot to ask where he got the data for that one). And just like those computer games, the missions at Citizenside get harder as you go along, with the early stages requiring you to capture a relatively easy-to-obtain image, and the latter requiring, say, a good image of a state leader or an important newsworthy event. Perhaps the most interesting thing Trippenbach talked about was how the agency uses that points-based gaming system not just for engaging users, but to help with assessment and verification of user-generated content, always a thorny issue for citizen press agencies. If we get a picture from a level 35 user, well, it takes a long time to get to level 35 or 45, and the Citizenside editorial team know that that user has demonstrated commitment to our values. So not only does the gaming element of the operation help engage users by breaking down their involvement into a series of incremental tasks and levels, it also is a huge advantage to Citizenside for an indication of the reliability of the content it is receiving. If its someone who has submitted five packages and five of them have been refused, well, we know what that is, but if it’s someone with a 100 per cent record, well, fine. We have a trust system that allows some users to post directly to the homepage and be post moderated. As well as information about the user, Citizenside uses software to access data about the package itself. This technical side of the verification process can potentially allows the agency to see whether an image has been edited in PhotoShop or uploaded to Flickr, and reveal when and where it was taken and uploaded. I want to return to the issue of gaming and engagement quickly before I finish. However many journalists Trippenbach has seen turn their noses up at gaming, I have seen examples at this festival of gaming creeping in to some of the best and most popular mainstream journalism taking place. Citizenside’s example of breaking the user engagement down into small, incremental stages has echoes in the Guardian’s MPs expenses app, which aimed to crowdsource the examination of the 458,000 documents published. The app had two million hits in the first two days but, as the Guardian’s Martin Belam explained recently, users were unenthusiastic because the process hadn’t been broken down into achievable-seeming stages. When a second batch of documents were released, the team working on the app broke them down into much smaller assignments. That meant it was easier for a small contribution to push the totals along, and we didn’t get bogged down with the inertia of visibly seeing that there was a lot of documents still to process. So gaming doesn’t necessarily mean the fully-fledged computer games we play on a PlayStation, it can be the simple interactive engagement of the Guardian app, or the New York Times’ Budget Puzzle interactive in which you attempt to solve the deficit. As Trippenbach acknowledged after the session, gaming is not yet taken seriously as a medium. But at Citizenside it may be the solution to the two key problems facing any citizen agency, engagement and verification, and for that reason you can bet that they take it very seriously. This entry was posted in Citizen journalism, Design and graphics, Events, Photography and tagged #ijf11, Citizen journalism, Citizenside, gaming, interactive journalism, news:rewired, philip trippenbach, photojournalism on April 16, 2011 by Joel Gunter. If you’re not able to make Journalism.co.uk’s digital journalism event news:rewired – beyond the story taking place tomorrow (Thursday 16 December), never fear – we’ll be providing lots of coverage of the day’s events, news and views on newsrewired.com, Journalism.co.uk and Twitter. You can read more about who’s attending and who’ll be speaking on http://www.newsrewired.com. On newsrewired.com there will be blog posts covering each session and a liveblog of the day broken down into the sessions again from Wannabe Hacks’ Nick Petrie and Matt Caines. The BBC College of Journalism will be on handing filming snippets from the day’s action, which will also be posted on the site and speaker presentations will be added to the website as soon as possible after the event. To follow others’ tweets and blog posts about the day, use the newsrewired.com buzz page or follow the hashtag #newsrw. We’ll also be tweeting from the @newsrewired Twitter account. This entry was posted in About us, Events and tagged #newsrw, about us, Journalism.co.uk, news:rewired, news:rewired beyond the story on December 15, 2010 by Laura Oliver. 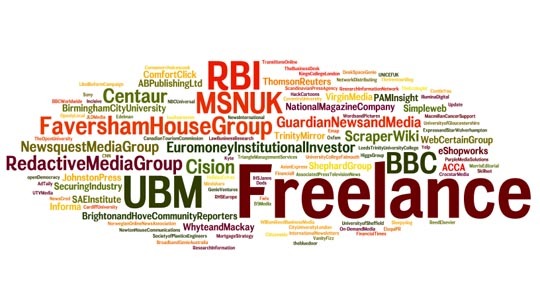 This liveblog will pick up the tweets tagged #newsrw at Friday’s news:rewired event. Follow here, or via news:rewired.com. This entry was posted in Events, Handy tools and technology, Social media and blogging and tagged #newsrw, Journalism.co.uk, msn uk, news:rewired on June 24, 2010 by Judith Townend.